Detroit police say they have discovered nearly three dozen cremated remains found inside of a Detroit funeral home after a search warrant was executed Wednesday. The search was conducted at the abandoned Howell Funeral Home where remains were found in the attic and basement of the building. Police say they are still working on identifying the bodies. 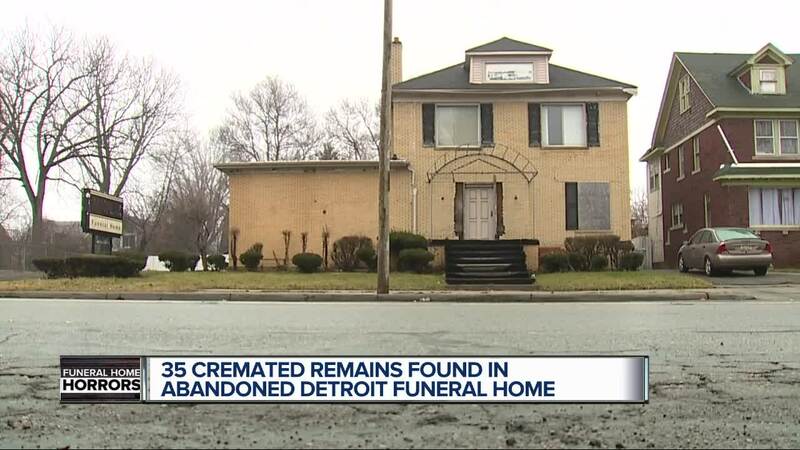 DETROIT (WXYZ) — Detroit police say they have discovered nearly three dozen cremated remains found inside of a Detroit funeral home after a search warrant was executed Wednesday. The search was conducted at the abandoned Howell Funeral Home where remains were found in the attic and basement of the building. Police say they are still working on identifying the bodies. "It's a scary thing to see that that’s going on still," said Pastor Jerel Bland, who just moved to the neighborhood 10 months ago. Bland recently purchased the Saint Gregory Church across the street from Howell, and had plans to purchase the abandoned funeral home. "It’s actually been on our list of properties we wanted to buy and help to revitalize the community," Bland said. This is the third Detroit funeral home in recent months where cremated human remains have been discovered. In late 2018, Cantrell and Perry funeral homes went under investigation by the Michigan Department of Licensing and Regulatory Affairs (LARA) after several infant and fetus remains were discovered improperly stored and in the ceiling of the funeral homes. In October, 11 infants remains where found inside the Cantrell. Also in October, 63 fetuses were found inside the Perry funeral home on Trumbull. Perry Funeral Home has since had its license revoked and been shutdown. Cantrell Funeral Home closed April 2018 due to several violations and "deplorable, unsanitary conditions." Detroit police are still investigating the most recent findings at Howell Funeral Home. "To find some remains in another funeral home in the city, hopefully they can find out and notify families they belong to so they can put some closure to some things," Bland said.